If you would like to purchase one book or multiple copies of one book please click the ADD TO CART button for your location. If you would like to purchase more than one book or multiple copies of more than one book, please click the MULTIPLE ORDERS button, and fill in the form, so we can work out the shipping based on your total purchase. Thank you. A step-by-step approach to drawing. 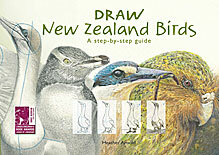 With a few materials, drawing skills and techniques you can draw your own images of these unique birds. Tells the dramatic story of Auckland's most striking icon, the island of Rangitoto. 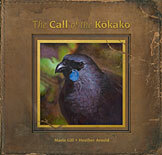 Find out about its volcanic birth, the kākā's connection to it, the imprint of humans on its fragile wildlife, and how guardians are saving it today. books | about | shop | multiple orders | order & shipping information | contact © Heather Arnold 2014-2019. All rights reserved.